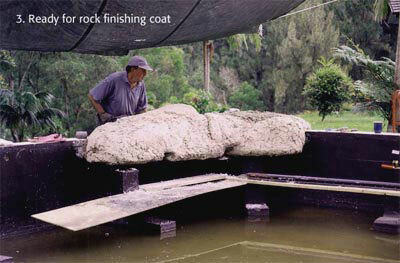 How to Make Hollow Artificial Rocks, Transportable Fake Faux Boulders for your Garden or Pond. 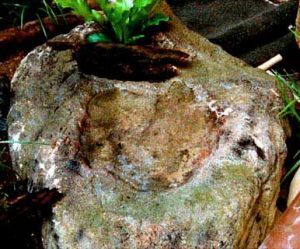 Discovery throughout the internet will yield you a wide variety of simulated and synthetic hollow artificial rocks and lightweight artificial type rock concepts and different techniques for making fake hollow garden rocks. 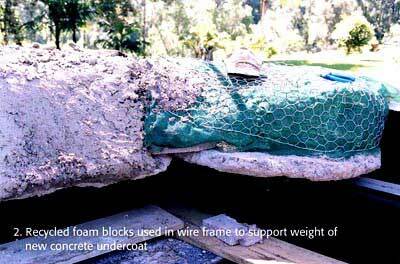 The following images will show you an array of fake and hollow artificial rock feature designs based around our methods of concrete and portland cement layering. Making hollow rocks has lots of advantages for the makers of artificial rock consequently some areas of hollow framed rock structure requires a high level of qualified construction expertise. How to make Fake Rocks that are Hollow and Very Light Weight! 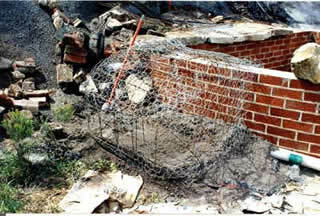 Most hollow rocks are made over wire or rebar frames. furthermore An example of this can been seen here. A low growing African Daisy wraps itself around the edge of this handmade garden boulder. 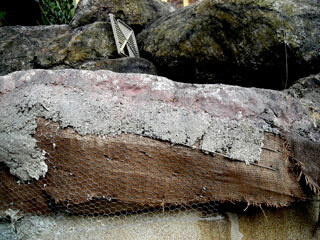 This boulder is actually hollow and is built over a wire frame, packed with recycled foam. 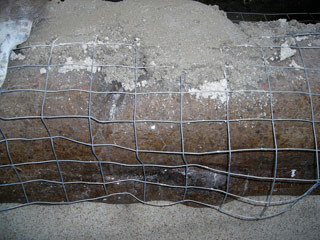 A close up of wire mesh, over original surface which is to be covered repaired or refinished. 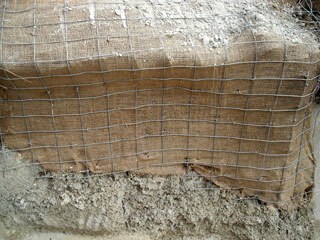 Hession ( Burlap ) overlaid on wire frame and secured with another layer of wire frame over hession. Bird wire can also be used. Coating maybe over hession. To render onto. Sample of near complete pool coping finish over over hollow rock frame. I tend to take the colours high at first and then tone them down to a more subtle finish. Pool coping part solid rock making and hollow rock making over a wire and hession frame on the faces. 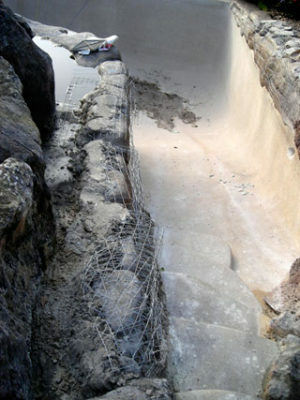 Amazing pool coping finish over old work. Hand made boulders combined to to make a pool edging. 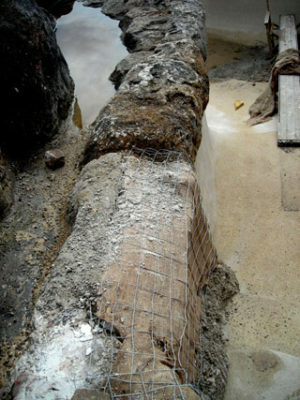 A rebar and bird wire frame hollow rock cover will become the protective housing for an external pump for large waterfall. 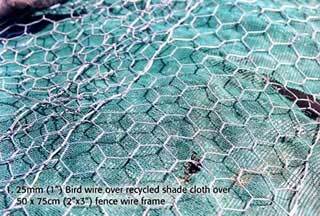 Bird wire and recycled shade cloth over wire structural frame. Partially concrete coated future hollow rock water feature. 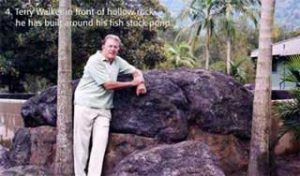 This is the part results of a friends efforts in constructing several hollow and solid artificial rock outcrops almost around a walled fish pond. 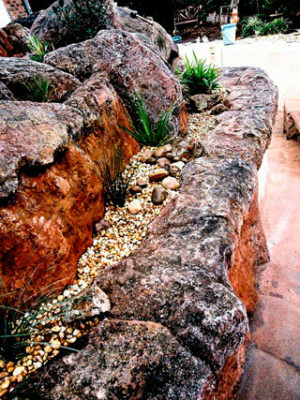 This large hollow artifical planter boulder forms on its left edge a line for an artificial rock staircase leading down to a pool deck also on its right retains a raised garden area. The planter insert houses a very happily growing ‘dietes bicolour’ also known as an African lily. 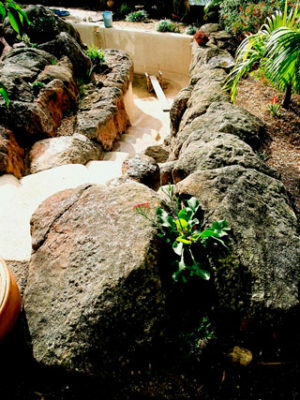 A large rainforest like hollow boulder sits in an interior natural creek design. 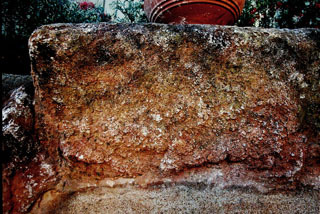 The rock has its own catchment pond and a planter insert into which a ‘birds nest fern’ now calls home. If you were to use both techniques to build similar size rocks than this would become very evident. However with the Hollow Rock technique you can do things that would be difficult with the Solid Rock technique. In summary, both techniques have enormous potential for the home landscaper-gardener or professional. 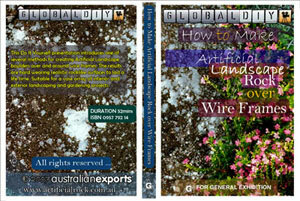 This title details the construction of hollow, framed Artificial Rock using a combination of Galvanized Fencing Wire, layering fabrics and a two layered mortaring (sand and cement) system. Hollow Rock making is very useful for all types of Artificial Rock applications. 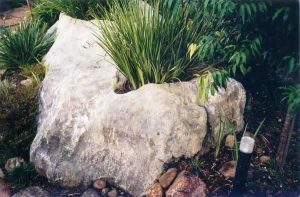 Generally Hollow Rock making does require more of your time to complete a rock than the Solid Rock technique, although it is more useful in certain circumstances, such as planters.